Rowbotham starts his Experiments chapter with an introduction to the Drop = 8 x (distance in miles)^2 rule. See below. The actual experiments can be found from page 2 onward. Flat Earth believers often quote the “8 inches rule” rule when discussing “the supposed curvature” of the Earth. 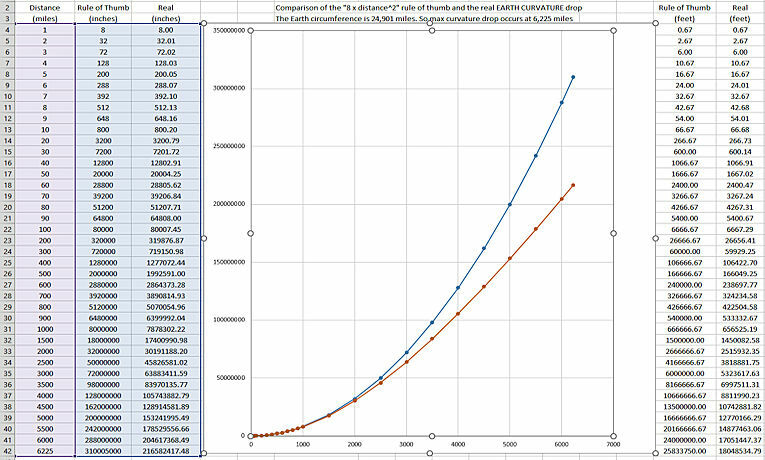 In every mile after the first, the curvature downwards from the point T increases as the square of the distance multiplied by 8 inches. The following table will show at a glance the amount of curvature, in round numbers, in different distances up to 100 miles. Curvature in 1 statute mile: 8 inches. Curvature in 10 statute miles: 66 feet. Curvature in 20 statute miles: 266 feet. Curvature in 30 statute miles: 600 feet. Curvature in 40 statute miles: 1066 feet. Curvature in 50 statute miles: 1666 feet. Curvature in 60 statute miles: 2400 feet. Curvature in 70 statute miles: 3266 feet. Curvature in 80 statute miles: 4266 feet. Curvature in 90 statute miles: 5400 feet. 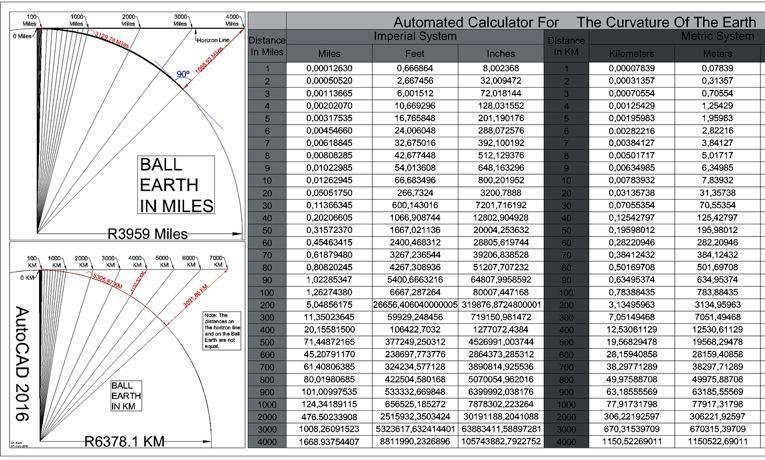 Curvature in 100 statute miles: 6666 feet. It will be seen by this table that after the first few miles the curvature would be so great that no difficulty could exist in detecting either its actual existence or its proportion. On the next couple of pages Rowbotham will show a number of experiments attempting to detect curvature. Failing to detect any curvature, his conclusion was the Earth must be flat. How accurate is the 8 inches rule? What is the real formula for curvature drop? The actual formula is: drop = (SQRT (radius^2 + distance^2)) – radius.